What is Microcurrent and How Does it Work? MICROCURRENT is a low level of current which mirrors the body’s own natural electrical impulses. These impulses which help maintain muscle tone and skin elasticity slow down as our bodies age. In conjunction with specialized products and manual manipulations of more than 30 facial muscles, a Micro-current treatment stimulates your body’s currents resulting in visible firming and smoothing of the skin. Oprah: "Treatment of youth coveted by Hollywood stars"
Dr. Perricone: "By tightening and toning with microcurrent, the face looks younger, increases volume and overall reduces wrinkles." Dr. Peter Hanson: "Muscles are restored to their youthful form, not cut or altered." Am I a Candidate for the Microcurrent Face Lift? How Does the Skin Respond to Microcurrent? Jewelry needs to be removed and if you are wearing a high neckline, you will be given a spa robe to change into (otherwise a towel will be used to protect your clothing). You will be made comfortable on the facial bed and your skin will be cleansed although care will be made to keep your mascara and eyeliner in place. The muscle-stimulation portion of the treatment takes a little over half an hour. During the early sessions, you may not feel the current. However, as you progress during your course, you will experience a tingling sensation at the higher levels. After the muscle lifting portion of the treatment, a concentrated product will be introduced to your skin with the aid of ionization, which encourages deep penetration of active ingredients. A finishing cream is applied to end the treatment. After your microcurrent treatment, you may apply makeup again – Your Skin Care Professional may apply some Mineral Make-up with sun protection before you leave the Spa. 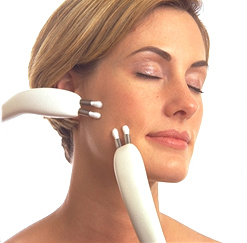 Yes - The treatments are non-invasive and completely safe. No - A mild tingling may be felt. Most clients find the procedure relaxing. This depends on the individual and will be determined during your initial consultation, but generally, a course of 12 sessions is recommended. Two sessions are scheduled per week, although some clients start with three sessions a week for the first two weeks. A booster session every four weeks is required to maintain results. This can be worked into your relaxing monthly facial. Can I combine this with other cosmetic procedures? Yes - Micro-current will complement other cosmetic procedures and enhance their results. $95 per session with a discount for a course of sessions paid for in advance. "After receiving Pericone's new book "Forever Young" and reading about microcurrent, I thought I should check it out. Le Mani came up first when I did a Google search so off I went to try it a microcurrent bio-facial at Le Mani. I love the fact that those jowls that I've been worrying about for the past few years have started to fade. Gail, the spa owner explained to me that microcurrent retrains the muscles and the improved muscle tone helps to create a lifted and more youthful appearance. I also ordered some hyaluronic acid capsules online and have been taking them twice a day. I've even had some compliments, which if you're over 50, you know are few and far between. 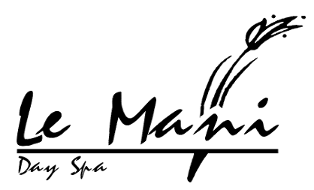 :-) I love the atmosphere at Le Mani and the people who work there are terrific!"